One would think that, when realizing it’s referring to a coach with a 1-31 record, the above headline is obvious. How could keeping Hue Jackson, despite his being just removed from an 0-16 season, be considered anything but a mistake? Of course, that’s just how I felt about the decision. 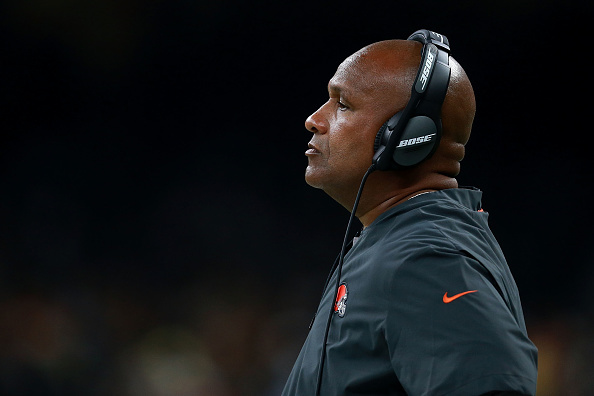 The Cleveland Browns felt differently, under the belief that keeping their beleaguered coach was the right move to make. Two weeks into the season, we’ve received nothing which would lead us to believe this was the correct call. Instead, the team is just seeing more proof retaining him for a third season was a bad idea. Jackson entered the 2018 season needing to quickly provide an answer to an important question – what am I doing that proves I was worth keeping? The answer, so far, is nothing. Cleveland should very well be 2-0, yet last second blunders in each of its two games prevented this from happening. Instead, the Browns are 0-1-1, though many with the team have rightfully admitted the Week 1 tie should be viewed as a loss. While Jackson isn’t the sole reason this team still hasn’t logged a win since Christmas Eve of 2016, he certainly hasn’t done anything this season which inspires confidence. Instead, all he’s done over the past few weeks is prove he’s still in way over his head. He opened the season taking an inexplicably strong stance of preventing Josh Gordon from starting against the Pittsburgh Steelers, as if being held out for the first play of the game was some sort of punishment for the wideout’s training camp absence. However, lo and behold, Gordon was right there in the huddle on Cleveland’s first offensive possession. This past Sunday, the Browns once again had victory in their grasp, only to watch kicker Zane Gonzalez miss two field goals and two extra points, leaving eight points on the table in what turned out to be a three-point loss to the New Orleans Saints. One day later, we found out Gonzalez was playing through a groin injury. Jackson was understandably asked about both incidents in the days following each game. Clearly the head coach of a football team would have a very good answer as to why his players are starting when they’re not supposed to, or shanking kicks due to a sore groin. In response to both issues, Jackson essentially said “I have no idea.” He had no idea why Gordon was on the field to start in Week 1, despite his having a month and a half to plan for this contest. He had no idea Gonzalez was kicking through an injury bad enough it required an MRI the following day. Jackson is either lying or truly and completely oblivious. Neither answer looks good on his part. If he’s lying when it comes to Gordon or Gonzalez, it paints the picture of a coach who realizes he’s out of people to blame for his mistakes, and is simply feigning ignorance as a result. If he really was unaware, he’s admitting to being completely in the dark in terms of what’s occurring with his team. The man who constantly insists he’s “driving this bus” has no idea there’s a flat tire. I ask again, what is Jackson doing which proves keeping him around was the right call? He entered his third season in Cleveland with a fully fleshed out coaching staff, a cohesive and qualified front office and a vastly improved roster. Despite this, we’re still seeing the same clueless coaching. Not only does the Browns’ decision to retain Jackson already appear to be backfiring, it also paints them into a corner when it comes to this week’s contest. Should Cleveland lose to the New York Jets on Thursday, it’ll bring Jackson’s record to 1-33-1. Additionally, it would likely increase the tension which is surely already present within the team facility. With ten full days between this week’s game and the next, it’s as good an opportunity as the team can get to make a significant change. While a midseason firing is never ideal, this is the situation Cleveland finds itself in thanks to the decision to bring back a coach with a historically terrible record. The Browns bet big on the belief Jackson could turn things around when provided with the right support. That’s exactly what he received.